Our Steel Nail Stakes, available here in a 10-Pack, are serious business. If you're tired of securing your tent with flimsy tent stakes that easily bend and break, you've arrived at the solution to your woes. 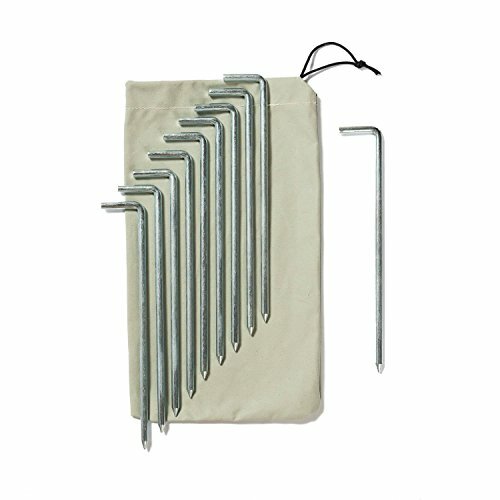 Go ahead, get a mini-sledge and wail on these Steel Nail Stakes, they are built to take a beating.12-inches in length with a sharpened tip, and made from ¼-inch diameter solid steel that's plated to prevent corrosion, these stakes are ideal for securing Springbar tents as well as other large tents and are best suited to hard, rocky soil. We'll also add that these are the ideal tent stakes for the playa. If you have any questions about this product by Springbar, contact us by completing and submitting the form below. If you are looking for a specif part number, please include it with your message.